The multi-talented 12th-century Abbess Hildegard von Bingen was, amongst other things, a naturalist, scientist and visionary and one of the most prolific writers of her times. Amazingly over 70 compositions of hers survive and here the Scandinavian ensemble Les Flamboyants present a selection from her Symphonia Harmoniae Caelestium Revelationum. Interwoven with these pieces are works from Cantus Sonorum by St. Birgitta von Schweden, a 14th-century nun whose life has certain parallels to Hildegard. Les Flamboyants are formed from the singers Miriam Andersen, Kelly Landerkin and Marilia Vargas, with Susanne Ansorg on medieval fiddle and recorder/flute by Michael Form. For this album instrumentalists do more than provide the expected drones, in four pieces they give extended improvisations on the music of both women which, on the whole is very successful and often mesmeric. Hildegard is famous for many reasons. She came to wide attention in the early 1980s with award-winning recordings from Gothic Voices and Sequentia and she had also been discussed in 1970 when Oliver Sacks wrote his book on migraines in which he suggested that her many and detailed visions were, in fact, migrainous. I find that the beauty of the music contained in this new release sounds a million miles away from the torment of such neurological disorders but there is no denying that whatever the cause, her vivid visions provided much inspiration throughout her life. A chief characteristic of Hildegard's music are long flowing melismatic passages that encompass huge ranges to give a feel of 'stretched' plainchant. The singers of Les Flamboyants are clearly comfortable in these often challenging vocal passages and have a luminous and unhurried style which lends an air of enchantment to their performances. 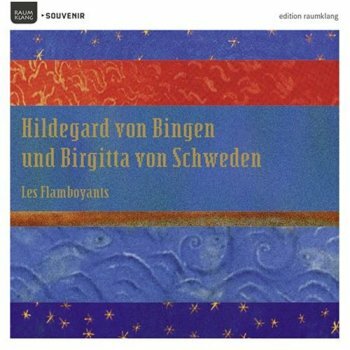 The more syllabic music of Birgitta von Schweden provides a wonderful companion to Hildegard. Not only is it surprising that almost two hundred years separate these women but also the smaller range of Birgittas' compositions only further illustrate how unique Hildegard actually was. This observation is not intended to downplay Birgitta's own works but I was struck by the differences in style that one inevitably notices on an album such as this. The choice of acoustic space, vast and generous, is typical for this repertoire and I presume that such long echoes are preferred because the Gothic style was emerging during Hildegard's lifetime but I occasionally feel uncomfortable with the relentlessness of the reverb in this offering. Maybe performers worry that we won't enjoy monody without much ethereal wafting but if, like Les Flamboyants, there is going to be a lot of creative recorder playing as well as the usual drones then I think I could do with slightly less so that the texture does not become so hazy. Having said that, I applaud the way the liner-notes state that despite accompaniment by flute and vielle being expressly against Birgitta's wishes Les Flamboyants have decided to use them anyway to create a modern performance and in doing so present more than just the historical elements of this music. This sort of reasoning shows a pleasing move away from abdicating one's responsibility as a performer in deference to a blind form of instruction-following but, I must say, overlapping phrases between singers and flute can get rather dreary after a while. This is a beautifully recorded disc and contains many fine and uplifting performances of music which, whatever your tastes, is absolutely fascinating stuff. If you need introducing to or re-acquainting with Hildegard and Birgitta then this will not disappoint. And whether or not you approve of the improvisatory element there is still no need to worry about migraines, as the only remotely uncomfortable thing on this album is the computer-generated pattern of the booklet cover!